Garry Shead (b.1942) is one who has vivid memories of Mount Pleasant. Maurice O’Shea was Carry’s uncle. His mother, Nora Florence O’Shea, married Gordon Shead in 1937. She was Maurice’s youngest sister. As a child, Shead recalled driving from Sydney’s North Shore to Mount Pleasant during the Easter holidays. The vintage was in, and it was a time to celebrate while the wines matured and slumbered in their darkened casks. Love on Mt Pleasant, A exhibition not to be missed. A pictorial tribute to the great winemaker Maurice O’Shea (1897-1956) by his nephew, Garry Shead (b. 1942) has opened in Gallery 2 at Orange Regional Gallery. We have mounted this excellent exhibition to accompany the festivities of Orange Wine Week. Love on Mt Pleasant has been curetted for us by Hill End curator Gavin Wilson, who has collaborated with Orange Regional Gallery in many a project over the years, most recently Cuisine and Country which was generally regarded as the best touring exhibition of the last three years. Garry Shead also has connections with Hill End, a unique place which has attracted artists since the late 1940’s, and it was fortuitous that Gavin noticed some of the Maurice O’Shea works in Garry’s studio and suggested that he curate an exhibition featuring this series of work. Maurice O’Shea was certainly the first great winemaker in Australia’s history, producing numerous great wines, but one in particular, the 1937 Mountain “A” Dry Red has been described by wine luminary James Halliday (who tasted it sometime in the 80s) as a “perfect wine…a wine that will live with me for the rest of my life”. 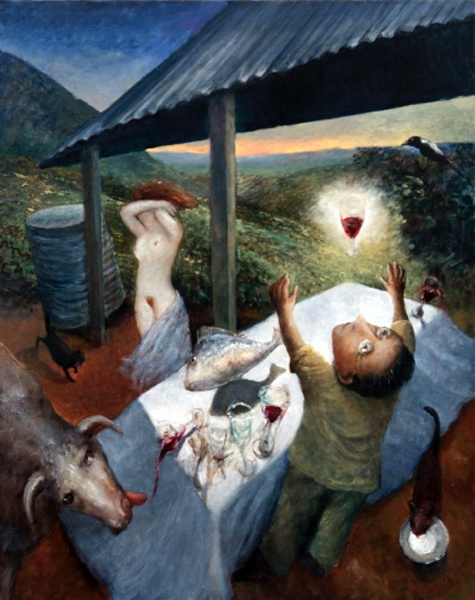 Maurice O’Shea had an influential involvement with the art scene in Australia, not only as the mentor and inspiration of his Archibald Prize Winning nephew, but also attracting to his winery art scene leaders like Hal Missingham and Rudy Komon, the latter being credited with introducing good wines to many Sydneysiders. Many other artists made their way to Pokolbin to sample the fine wine (and food) that Maurice O’Shea produced, a pilgrimage not unexpected given the ancient conjunction of wine with art. O’Shea was a cultured and educated man, having lived in France for nearly eleven years studying chemistry and viticulture and sampling the great vintages of Europe. In the first half of this century there was not a lot of good wine produced in New South Wales, and the market for fine wine was developing only slowly. For the few in the know, Maurice O’Shea was a legendary genius. Demand grew after the second war, boosted by the more sophisticated tastes of the many European migrants and those returning from the grand tour, but aided also by the gregarious types in the art scene who by now insisted upon good wines as essential to their lifestyle. This exhibition is not however a history of Maurice O’Shea or the growth of an industry, but rather a poetic account of O’Shea’s working methods and his love affair and marriage to the young Marcia Fuller. This marriage of a young Methodist girl from Melbourne to the dedicated Roman Catholic winemaker O’Shea was star crossed from the start in those conservative times, and O’Shea was threatened with excommunication, but the exhibition is not about the breakdown of a marriage, but rather the potency of love, which even in its grievous deprivation can act as a stimulus to great things. It was the very year of his marriage break up, 1937, that Maurice produced his greatest wine. He said “That wine is my heart and soul in a bottle”. Garry Shead, in his inimitable poetic style, has painted significant events in this romantic story, and the exhibition is a moving tribute to a man who inspired many, as well as to the powerful influence of love. It is also a record of O’Shea’s terrific old tin winery, later controversially demolished by McWilliams as “an unsafe workplace”. The exhibition features paintings from 1953 to the present, as well as some recorded interviews with people who knew the winemaker. A colour catalogue has been produced with an essay by Gavin Wilson. If Wine Week activities are meant to generate tourism to the Orange region, the Gallery’s contribution has been a notable success. In Gallery 2 we are currently showing a pictorial tribute to the great winemaker Maurice O’Shea (1897-1956) by his nephew, Garry Shead (b. 1942).This Opened last week as a wine week activity, but will run until 22 November. The exhibition attracted many people from Sydney and other parts of the state to the Opening, and is still bringing people to Orange aided by word of mouth and a bit of publicity in the Sydney press. The Opening was conducted by the famous Sydney restaurateur Lucio Galletto. Lucio is becoming a regular at our events, having spoken to a crowd here on the occasion of the auction of local artworks a few months ago. He is known not only for the excellence of his restaurant, but also for his art collecting and his willingness to swap a month’s meals for a painting from a rising artist. His speech was extremely funny, combining anecdotes of his own youth in rural winemaking Italy with praise for Australian art and artists and of course, for Garry Shead. Lucio remarked on the coincidence of there being a painting in the show of Maurice O’Shea helping a boy out of a large empty wine barrel. Lucio said his own winemaker uncle would get him to do the barrel cleaning from inside, and how proud it would make him feel to be the only one able to fit inside the barrel. He also said he would squeeze out of the barrel with his knees wobbling and his eyes crossed a state he later recognised as being drunk! The exhibition drew many artists from far and near, many from Hill End, as well as the distinguished artist John Olsen, who said a few words after Lucio about the exhibition. This is indeed a lovely and poetic exhibition, which I believe is the best work from Garry Shead for quite a few years. In honouring and documenting his late Uncle’s contributions to Australian viticulture and gastronomy he has made an exhibition which is I believe straight from the heart…there is no sense of him searching for a subject. Garry has brought Maurice O’ Shea to life in this exhibition, with his eccentricity and cultured manner. Garry was only fourteen when Maurice died, but knew him very well from holidays on the vineyard and farm and regards him as his mentor. Like Garry and other notable creators, Maurice O’Shea was in search of excellence…not money or material possessions, which were the least of his motivations. The exhibition plumbs his motivations, so we know that his muse was firstly a passionate love for his young wife, but also a passionate love of discovery and the craft of winemaking.